About MAA Garment and Textiles Factory! • Our company Kebire Enterprises PLC is a privately owned company established and registered in April 2001 under the commercial laws of the Federal Democratic of Ethiopia. MAA Garment & Textiles Factory began its operation in June 2004 in the northern part of Ethiopia, Tigray, Mekelle wholly owned by Kebire Enterprises PLC. • It is spearheaded by dynamic local staffs combined with expatriate from Turkey, Pakistan & Philippines, with production set-up fully equipped with state of the art machineries & equipments from renowned manufacturers in the world like Juki, Brothers, Myers & Cie, THIES, and MONFORTS. 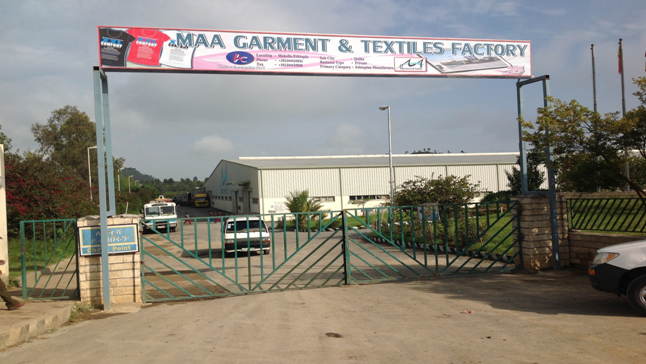 • MAA Garment and textiles factory is emerging to be one of the leading apparel manufacturers not only in Ethiopia but also in the rest of the world. • Our company’s recognition has reached its utmost peak since its establishment and our produced goods have revealed our energy in the industry of garments. Embedding methods and solutions to our production system has allowed us to blend in more quickly in the international market, and though our main objective was to export garments internationally, we’ve engaged ourselves to fulfill the needs of the domestic market as well. We intend to incorporate and upgrade our infrastructure, maintaining the concern with our environmental and social responsibilities, so our ultimate goals are achieved in a short period of time. • To become the most customer oriented manufacturing by creating a quality excellence in the textile and garment fields in Africa by 2017. • To continuously produce and export quality textile & garment products to the world market with consistent performance and productivity using state of the art technology and skilled manpower applying a quality management system by creating a healthy, creative, respectful, and fun working environment, in which our employees are fairly compensated and encouraged to respect the customer and the quality of the products we produce.